There’s no problem to design wooden framed doors with mesh panels in Polyboard. Crown mouldings if profiled will have to be added in SketchUp. Can you send a few of your drawings? Thank you for getting back. Unfortunately, I really do not have photos. I was thinking of designing wood framed doors and lining the inside of the doors and cabinets with a thin sheet of metal and placing decorative mesh inserts in the doors. The cabinets will be designed as “furniture kennels” for dogs. 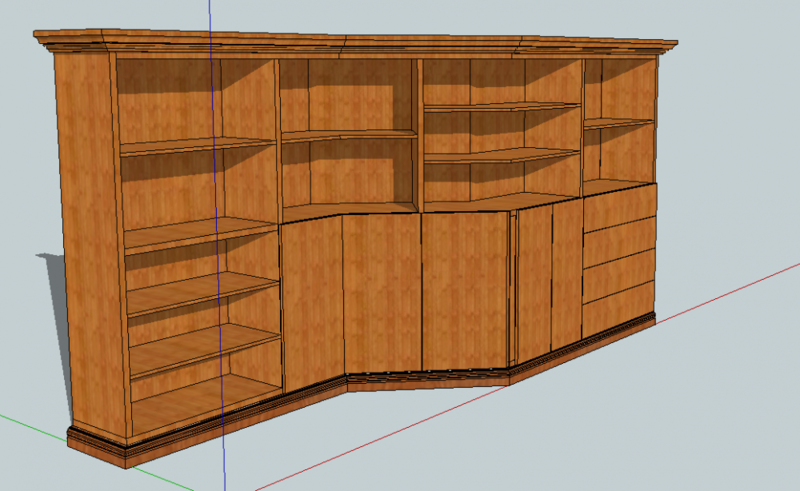 I was thinking of building them for various rooms in homes ie: living room tables, book shelves or built-ins, dining side boards, laundry cabinets, kitchen isle cabinets, entry benches, etc. My potential customers would be offered upscale designs with moulding or trims to match existing furniture styles. I have figured out how to build them, just don’t quite know how to put it on paper or screen for customer viewing. Polyboard will only work with rectangular sections so to add crown moulding or mouldings of any sort you will have to export the Polyboard 3D DXF model to another program like SketchUp. I’m not sure what you want to get for the door materials, can you post a photo ?